Not to be confused with Imre Horváth (Hungarian politician, born 1944). The native form of this personal name is Horváth Imre. This article uses the Western name order. 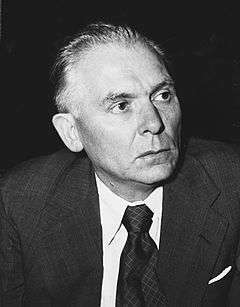 Imre Horváth (19 November 1901 – 2 February 1958) was a Hungarian politician, who served as Minister of Foreign Affairs twice: in 1956 and after the Hungarian Revolution of 1956 until his death. In 1918 he joined to the Communist Party of Hungary (KMP) and in spite of his young age he was one of the organizer of the labour movements. During the Hungarian Soviet Republic he worked for the political police. After the fall of the communist system he was interned. After the prison he made a connection with the illegal communist party. That's why he was imprisoned again and sentenced to ten years. He got into the Soviet Union with the occasion of a prisoner exchange. Here Horváth finished his studies and worked as an engineer. He returned to home in 1933 but arrested at soon. He spent ten years in prison at Szeged. In 1944 the Nazis carried him to Dachau. In the next year he came back to Hungary. He worked for some embassys. He was the Minister of Foreign Affairs between 1956 and 1958, except the Revolution of 1956 when Imre Nagy held this position. Horváth was the leader of the Hungarian delegation to the United Nations after the revolution. Wikimedia Commons has media related to Imre Horváth.